I've been addicted to these mitred square blankets for years now. I just can't stop knitting them. One thing I love about them is I can use up the tiniest scraps in these and combine every type of yarn weight into one blanket and it just dawned on me that this is similar to my love of collage! 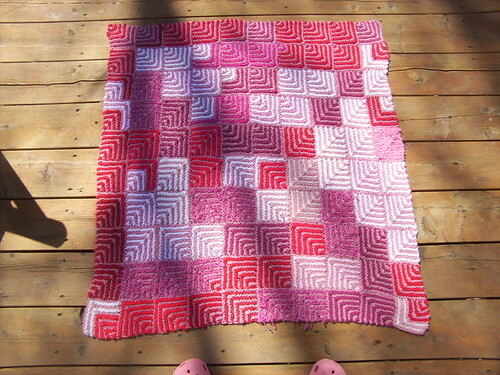 This one is small, I just kept knitting until I ran out of the main yarn and it is big enough to cover an end table. All the colors sort of move into each other. There is a flow that is so, so pretty.